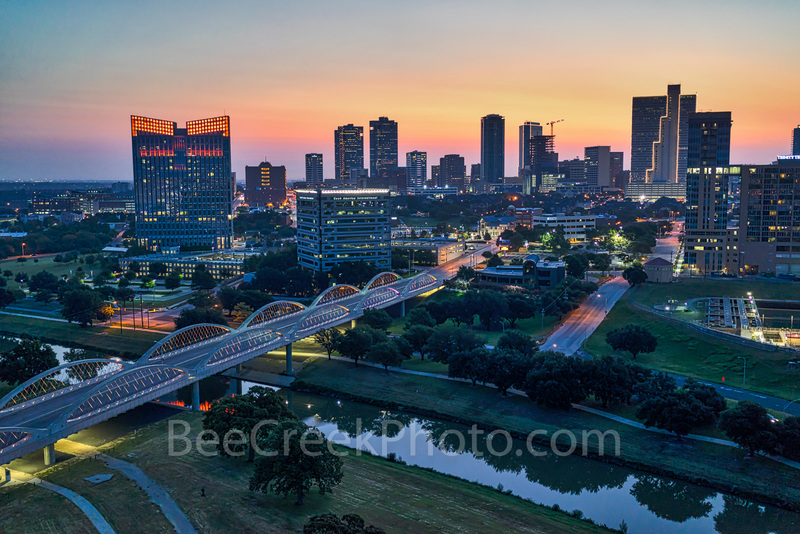 Fort Worth Skyline Sunrise Pano – This aerial panorama of the Fort Worth skyline sunrise was capture right before sun came up just as the sky was starting to light up with these pink colors behind the city. You can see the cityscape in downtown along with the seventh street bridge as it crosses the Trinity river in view. Again Fort Worth is the fifth largest city in Texas and it is located in central north part of Texas and the county seat is Tarrant County. The latest census is that the population for Fort Worth is estimates, at around 854,113. The city is the second-largest in the Dallas–Fort Worth–Arlington metropolitan area or the DFW Metro as some refer to it. Also the city was established as an army outpost in the mid 1800s overlooking the Trinity river and it still has a lot of design elements of this time. Today we capture this modern Fort Worth Skyline Sunrise over the city. 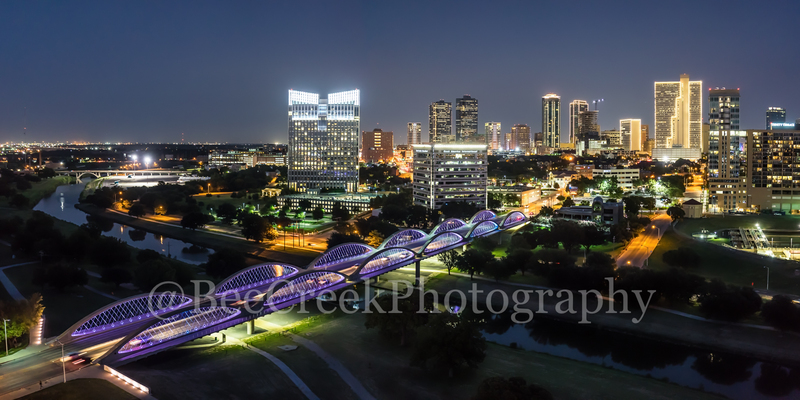 Fort Worth Cityscape at Sunrise – We loved the view from this location of the Fort Worth cityscape as the seventh street bridge crosses over the Trinity River at sunrise and draws the eye to the colorful early morning skyline in downtown right before the sun comes up. Fort Worth is the fifth largest city in Texas and the second largest in DFW Metro area. Orginally Fort Worth was a army outpost located along the bluff of the Trinity river but today it is now a modern city with many excellent museums like the Kimbell Art Museum. 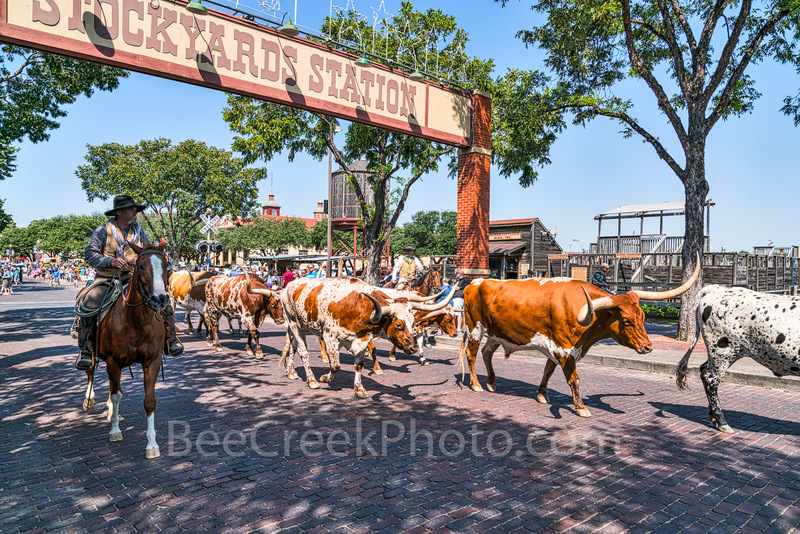 The city did retain some of it western history and they are in full display at the Stockyard where you can see the walk of honor with stars for many western figures like Wyatt Earp and Buffalo Bill Cody and the cowboy hall of fame. Now the area is mostly a western theme for shopping and dinning with that old timey historic feel theme shopping. 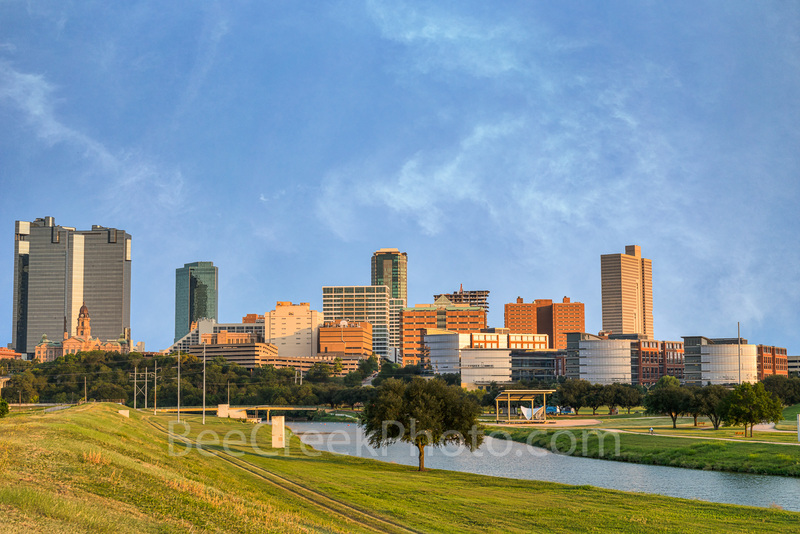 Fort Worth Skyline Along Trinity – Captured this photo of downtown Fort Worth skyline in late afternoon along the Trinity river. From here you can see the high rise buildings like the Burrnet Tower, Wells Fargo, The Tower, County Courthouse, Tarrant County College, along with many others buildings along the shore. We love the look of the cityscape along the river from this location. However, this location is not a safe place as once we stopped Fort Worth PD show up to warn us that they would rob us and steal our car so not to stick around too long. We had intended to come back later but decided maybe not the best idea. In any case this little cow town is all grow up. 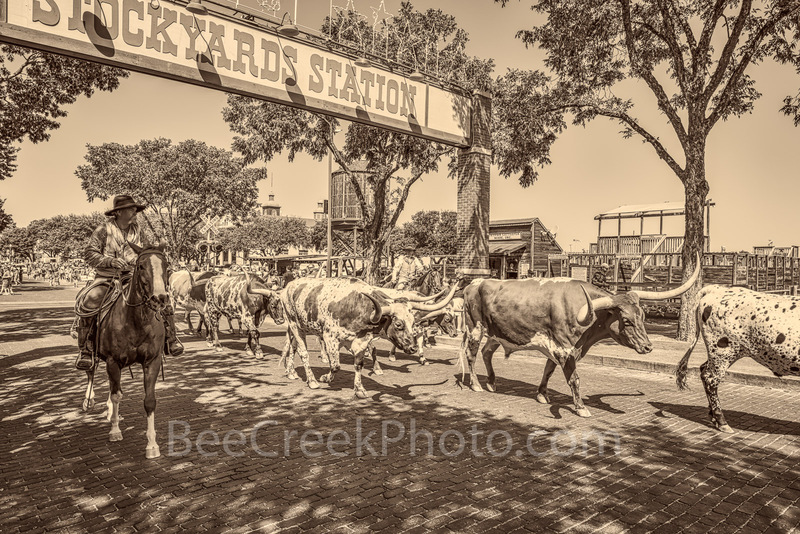 Posted in Best Of and tagged 7th street bridge, aerial, buildings, cattle drive, cowtown, DFW, downtown, Fort Worth bridge, Fort worth cityscape, Fort Worth skyline, high rise, historic, long horn cattle, river, seventh street bridge, skyline, Stockyard, sunrise, Tarrant County, Trinity river, twilight on September 19, 2017 September 25, 2018 by Bee Creek Photo. Check out these seasonal fall colors among the trees along the Frio river in the Texas Hill Country. 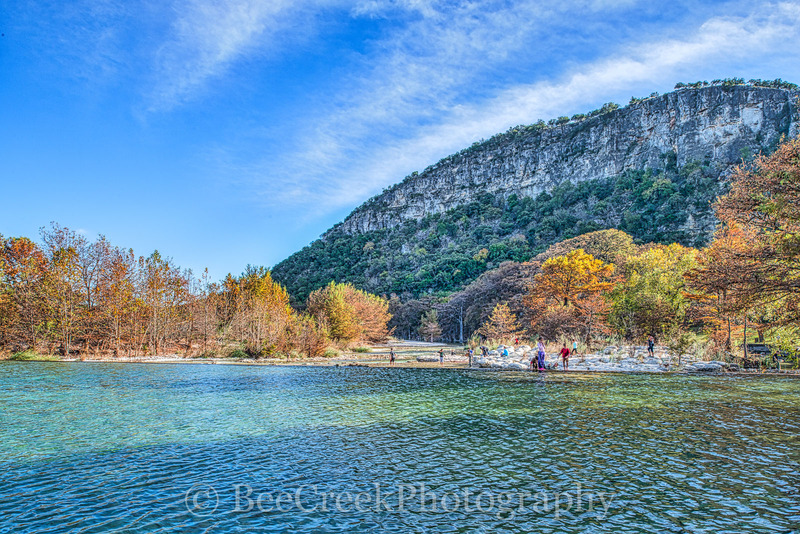 These images were taken in Concan and Garner State Park in the Texas hill country along the Frio river as the leave were changing colors on the maple and cypress trees last year. Concan is a small community in Uvalde County in the southwestern portion of the Hill Country of Texas. It sits along the Frio River close to Garner State Park. Every year it is a popular spot for summer vacationers. Garner State Park is located in the community of Concan,Texas. Garner State Park, is the most popular state park in Texas for vacationers. If you want to get one of the cabins or shelters here you better make your reservation early or you might now be able to get one. Even for campers the park fills up during peak season before noon on many days. As a child we went there almost every year for three weeks every summer and they were some of the best vacation times in my memory. The park has lots to do in the area you can swim, kayak, paddle boat, hike, bird watch, horseback riding, bike or explore the area around the park. One of the most popular thing that draw the locals to the park is the nightly dances at the pavillion beginning in the spring and summer. You don’t need to stay in the park there are plenty of other places in Concan to camp or stay along the Frio River but again if you plan a vacation there in the summer peak season you better plan it early to make your reservation. The word Frio is the Spanish word for cold, so keep that in mind before you jump in to the river. The Frio river is to me one of the pretties rivers with it clear emerald waters in Texas. 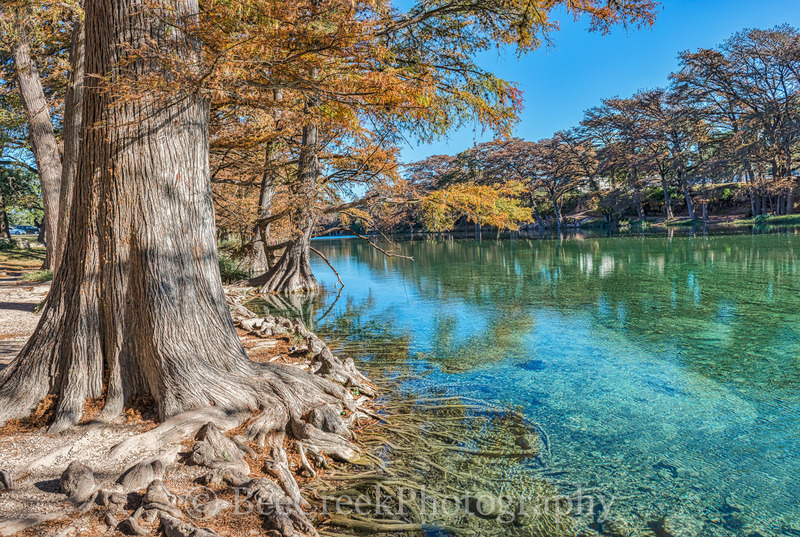 Garner State Park in the fall with the large cypress with their fall colors angainst the blue green waters of the Frio River can be a magical site. Old Baldy View – Garner State Park landscape with Old Baldy Peak as the Frio River flows over the dam down toward Con Can with the fall colors of the trees along the way. We capture this wonderful landscape with this cypress tree with it roots reaching out into the clear emerald waters along the Frio River. Garner State Park is very unique place with it emerald green clear waters of the Frio River as it flows through the canyons of the Texas Hill Country. This place is an excellent place to be on a hot summer day. However it can be just a beautiful on a fall day with the colorful fall colors of the cypress trees and maples along the river with the emerald green waters. This is one of the most scenic places in Texas. 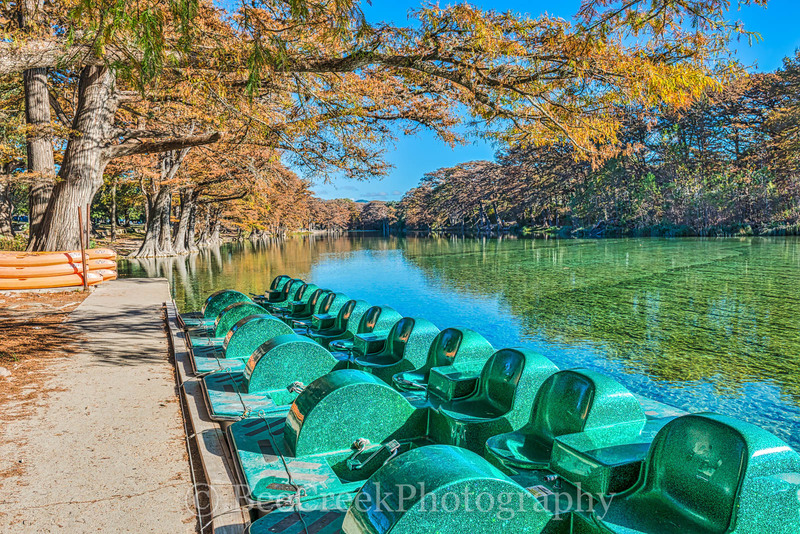 Garner State Park paddle boats wait on customers on the wonderful clear Frio river on this nice fall day. Fall is such a wonderful time to visit the park as the waters with their reflection and the cypress trees wonderful fall foliage in the landscape and early morning is such a tranquil time. 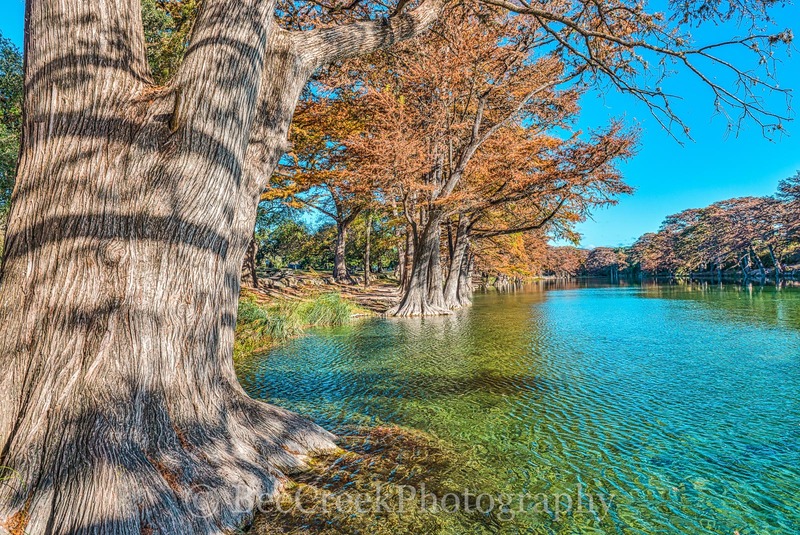 Posted in Best Of and tagged cold water, Concan, cypress trees, fall, fall colors, Frio river, Garner State Park, hill country, maple, springs, texas, Texas Fall scenery, Texas Hill Country, Texas scenery, travel, vacation on September 4, 2017 November 29, 2018 by Bee Creek Photo.